Discussion in 'Downhill & Freeride' started by frorider, Jun 7, 2012.
thanks to the slackerizing rear dropouts, and the Avy shock internals (Push MX shock -- dramatic improvement), the bike rides pretty well but one thing I can't change is the effective top tube / reach....it's too short for my 6' 3". & would be nice to have a full 1.5 headtube, but if it's tapered I can always buy a new upper fork assembly I guess. I already have a Nomad/Lyrik and DHR/F40, so looking for something in between. ...which means the SX Trail is the only option I can think of. 24.3 " ETT sounds good. OThers I'm missing here? Pivot Firebird seems to have a shortish WB and steepish HA. The SXT is sweet, a friend just built one up with a Fox 180. Trek Scratch maybe? Not sure if just the frame is available. Also, Reign X.
Reign X would also be a good option. plus, Mock Orange Bikes in Winston is a Kona dealer. And a Kona Entourage looks really interesting, whenever they come out -. I am in your exact situation, have a VPX and looking to jump into something else. I have my eye on a Pivot Firebird and a Gian Reign. Both look great, and go-ride has both on closeout right now. But you knew I'd say that. Wouldn't mind an SXT at all. Problem is that Specialized does not cater to mtn bikers who live in the mountains, i.e. their model year switches in July so by the time I'm in ride mode (May/June) most of their sought-after framesets are already sold. And Specialized has no listings of which dealers ordered a frame-only, and they have a policy of not letting dealers ship new stuff by mail, so basically Special Ed is doing everything they can to make sure I'll never give them money. Still going to try calling some more norcal Spec dealers. Firebird felt too xc/am to me in my brief ride on it a while back, kinda like the mojo HD, but yeah I've seen that price at go-ride & i could go angleset. Didn't see a Reign X, just a Reign at go-ride. I have some contacts at Giant so a Reign X 2012 frame is an option I was looking into....but Giant is using that 1.25 upper steerer, which is not yet available from SRAM in aftermarket. Suppose there might be some sort of 1.25/1.125 upper race converter. 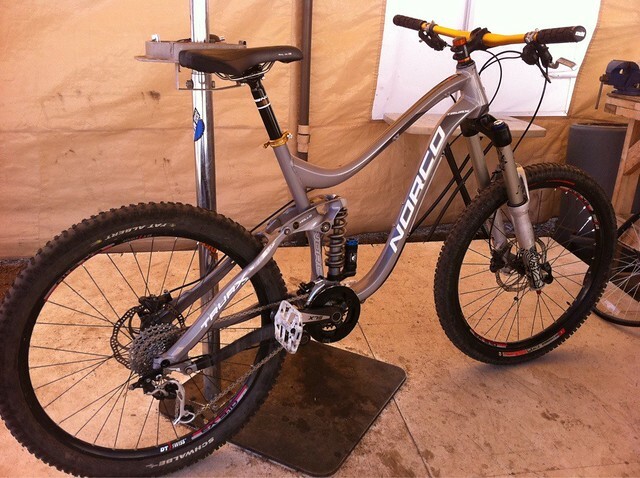 Norco has come a long way, and that HL frame looks decent. Some dealers in WA I may call. Busy skiing in January this year were you? I ordered mine in February (2011 model on sale). Seriously though, unless you KNOW the next model year will have something you just have to have, there's no sin in buying a frame that's more than 5 minutes old. Do you know for a fact that spec is out of the things? You're just looking for a frame? What size? Yeah, you'd just need to buy a new upper headset, the diameter of the upper steer tube is the same as 1.5 > 1 1/8", just a larger upper headset bearing to fit the 1 1/4" steerer. My friend bought his SXT from Mojo Sports in Denver, if they have one I'd ship it to you for a spare tire. yep, busy skiing in Jan. in Canada. and yep, I called specialized. if anyone happens upon a size L SXT frameset, pls PM me...I have many spare tires to send you as a finder's fee. meanwhile I'll look into getting a reign X frame. 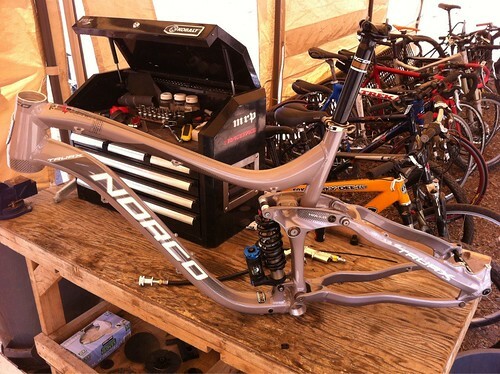 tracked down a Norco Truax frame but just can't picture spending MSRP on a Norco. i.e. can't imagine it will hold resale very well. I think it would come down to 4 bikes if it were me. One - I would be curious to see if it lives up to the hype but I would have trouble shelling out that kind of coin for a bike made by Pacific. I don't know what I would buy either. It would probably be between the Delirium and the Truax. The Truax looks pretty awesome. I haven't ridden it yet (finishing the build tonight), but the build quality on my 2010 Jedi is top-notch and I have heard nothing different from anyone else. I'm 5'10 and the medium 2010 Reign X fits me pretty well though I run a 75mm stem (slightly longer than I'd normally run). Its one of my favorite AM frames I've owned. The original Canfield One was one of the best bikes I have ever ridden. I got a chance to ride a friend's when he first got it and, for whatever reason, I felt like superman on that bike. I climbed and descended some stuff that I had never cleaned before. Same guy eventually upgraded to the new One. I only parking lot tested it, but it seems nice. Lot heavier, slacker. Felt much more aggressive than the old One. Norco's making some pretty good stuff these days. As far as an SXT vs. Reign X, those were two I was looking at a while back to replace a demo 7. Kinda depends on which 'side' you want to lean more to....something you'll be riding like a tough trail bike or more of a mini dh bike. The SXTs are long and low and definitely prioritize descending. Reigns really do feel like trail bikes. I'd say that should be more of a deciding point than what you can get. You'll be able to find either. is the reign sx the same geo as a reign x? I was eyeballing those before my sxt. The sxt does climb fine for basic singletrack and gravel road climbs. Just got done with a big oregon roadtrip, pedaling for every descent on my sx trail. Kinda missed my stumpy climbing, but the fun descents made it worth it. i was very impressed, after riding that bike for one run..
the reign x is a long travel trail bike that you can rally pretty darn hard. its much more like a nomad (that goes up and down a little better). the sx trail is more like a pedal capable DH bike. if you are looking to replace the UZZI, and you already have a nice 6" travel bike, the sx trail is more in line with that IMO. i would also suggest at least looking at the new transition blindside. 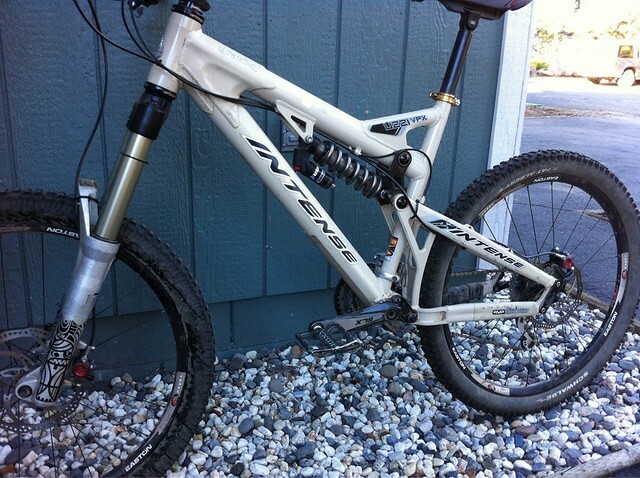 It's an unsexy single-pivot and not current product any more - - but how 'bout a Yeti ASR-7? Based on your criteria and the bikes you already own, the SX Trail is really a no-brainer. Perfect frame for your stated requirements. I'm 6'2" and my large is plenty big enough with a 50mm stem. I'm running coil/coil 180mm and two chainrings; bike weighs about 36 pounds and pedals quite well for what it is. You can shuttle it, pedal it, whatever. I'm incredibly pleased with mine. I've had an Reign X for a few years now, and have spent some time on the SX Trails. The SX Trail is the better DH machine, it feels like you're on a short travel DH bike. The Reign X still does really well with descents, but the rear suspension doesn't gobble up the trail the same way (it does pedal better however). decided to get the Norco. once i realized it came with water bottle cage mounts, it was a no brainer. size L frame weight w/ RC4 / 450 lb steel spring / syntace rear axle (but no water bottle cage) is 4.47 kg. lots of interesting design details. that bolt in the side of the downtube is a spare...the derailleur hanger itself doesn't break, but the mount bolt for it is designed to shear off (hence the spare). 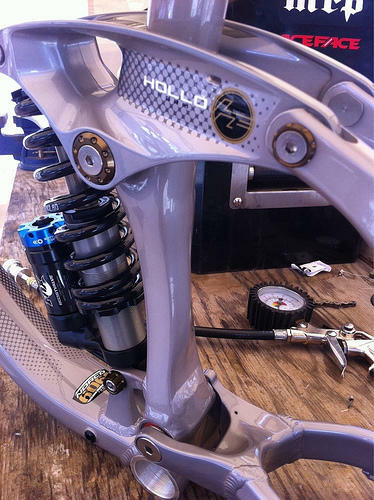 The hanger mount bolt also functions as a pinch bolt to hold the threaded nut of the syntace thru axle. 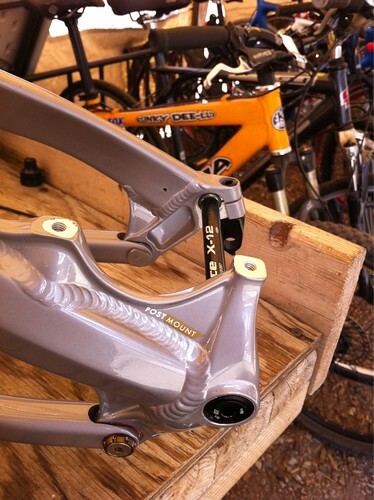 all pivot hardware, including the shock mounts, uses a threaded steel 'hat' as the receiving end of the pivot bolt. so the aluminum frame has no threads. Frame came with a decent cane creek 40 headset, and a 230 g faux Thomson post. Wow looks great man nice choice. That color matches some sweet stockings I have. finished the build...curiousity to ride a new bike always wins over doing my real job. 35 lbs something or other with sub-1000 g tires. Short ride today. Feels good so far.